It’s remarkably easy to download tweets from Twitter. You of course always have access to your Twitter updates via your own profile page, but once you’ve posted a few dozen it can be a hassle to scroll forever to review or capture them. Thankfully, you can do it very easily without an external application/website, or use of the Twitter API. All that’s required is a specially formatted URL string. There are all kinds of reasons why you might want to download Tweets. You might want to be able to keep a local copy to analyze the frequency or volume of your tweets and activity on Twitter; or import the XML and display it on your own website (though I don’t recommend this for SEO purposes because it technically counts as duplicate content). You might know someone who Tweets frequently and you don’t want to miss out on their content. You may need to download tweets for legal reasons, like being harassed or slandered on the net. You could be using a tool like Buffer to automate Tweets at specific times to reach your target audience. Whatever reason you have to download Tweets it’s remarkable simple to do. This is the most simple method to download Tweets. From your Twitter page, or the page of anyone else, simple tell your browser to ‘Save As’ and download the page. In Chrome the easiest way to do this is to right click on the page and click ‘Save As’. A dialog box will appear and you can name the download, and decide if you want to download the entire page or just as HTML. Now just save the data by choosing File -> Save As, select the location and file name and save the file. What’s great about this method is that because when you download tweets with this method the XML can be easily imported into Excel. Again, this is remarkably simply to do by creating a new Excel file to import the downloaded tweets into. Create a new Excel file, select the “Data” tab, and select get external data. Then choose “From Other Data Sources -> From XML Data Import”. When the dialog box opens navigate to where you stored the download tweets files and import the contents. Tada! Now, in addition to the raw XML data you have a more user friendly way to view the download tweets file. Of course your activity on Twitter can range from a random Tweet every couple of days, or it could be something you use as an over all social media engagement strategy that contains tons of Tweets relevant to your followers. This is where the “n” on the query string used earlier and the Excel file come in handy. As Tweets accumulate you can continue to download tweets any time you choose and simply continue to import the data into Excel. If you’re looking for ways to maximize the impact of your Tweets, it’s all about timing. You can increase clicks by 200% with Buffer. It’s simple, effective, and available everywhere you Tweet. If maximizing your Twitter reach is something of interest, look no further than Triberr. Every time you publish a new post, everyone in your tribe(s) will tweet it to their followers. You do the same for everyone in your tribe. This takes place automatically and extends the reach of your blog by exposing your content to an audience you’re not directly connected with – right now each post I write gets Tweeted to 497,810 people via the Tribes I’ve aligned with. If this was helpful, if you can’t figure it out, or want more info on Buffer or Triberr you can always find me on Twitter: @PaulSpoerry! Great article, Paul, thanks. I’m wondering if you know of a way to download tweets by keyword or hashtag, not by account. Companies like TrendsMap obviously have access to this data, but I haven’t found m/any apps that can export tweets in bulk for data analysis. I haven’t ever looked for that but if I run across one I’ll be sure to share Matt! I tried your second approach, “The better method”, but it turns out that it can’t download more than 200 tweets. 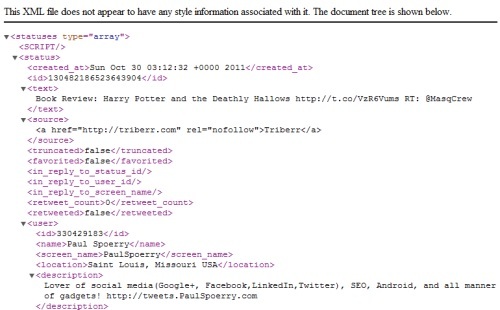 For instance: https://twitter.com/statuses/user_timeline/usnews.xml?count=1000 returns only the first 200 tweets. The usertimeline usnews has way more than 40,000 tweets. This seems to work fairly well, except that I can’t get all of my data. No matter what count I supply, this method only returns about 120 out of 500+ expected results. http://ifttt.com is certainly awesome and a very easy way to do it in an ongoing way. I used this tool before, but now it does not seem to work anymore. Anyone knows? Allmytweets.net and Tweetbook.in will give you 3200 tweets. Twitter rules don’t allow them to go back past that. I’m creating a scrolling marquee message board that I want to update via twitter hashtags. Basically, I want someone to hashtag a certain thing and it will show up on the message board. One way I’m considering is downloading the tweets to a xml, .txt, or other file then reading them and outputting them, but this wouldn’t allow real-time updates. Does anyone have suggestions? How could this be done real-time? I would like to introduce a product which helps you download tweets of any twitter user. You can even download more than 3200 tweets of a specific user with the help of this tool.